Radclyffe does stellar medical romances. The detail, the characters are always out of the pa Quinn again as well as a new dynamic due Sydney and Emmett. Sydnerk good. 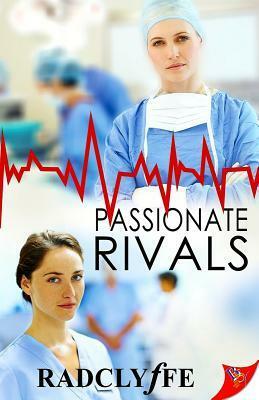 Passionate Rivals is the fourth in the PMC Hospital Series. You will see Honer andy Stevens in nearing the end of her fourth year of her surgical residency. She is at the top and slated to be the next chief resident at Franklin Health Center Hospital. Her world and her career get spun into chaos when Franklin announces it has lost federal funding for their surgical program. Now Syd and a handful of other doctors are headed to a new program across town at PMC. To start all over with new mentors and new co-workers. Emmett McCabe is the very best in her program, she knows it as well as everyone else. She is easily slated be be PMC’s chief resident. Well that is until Sydney Stevens comes back into her life. Emmett knows Sydney from way back when and she is the one women Emmett has never been able to forget. I loved the details of this book. You truly feel as if your standing on the hospital floor with Emmett and Sydney and their fellow doctors. The medical drama is done to perfection. However the romance I felt was a bit lacking. Still good mind you, Radclyffe’s always are. I just would have liked more heat and tension. You know unequivocally you are going to get your money’s worth when you read Radclyffe. This is no exception, not my favorite but a quality read nonetheless.